This particular morning we were up and at the safari vehicle with our camera kit at 6h00. It was sunrise around 6h45 but we wanted to get going in the early morning light before sunrise. At this time it was cool and fresh, and a time when the latent heat change which releases perfumes from the tree’s flowers and grasses. It is a time when you feeling refreshed alive and excited to start the day’s adventures. there is always great expectations about what we could see. We had scarcely left the camp and were just across the Mwagusi river when Justin, our guide, who was a wonderful character with good humour, in depth knowledge of the bush and excellent eyesight, saw a flash of colour in the long grass on the left side of the road. Soon the flash of colour revealed itself, we had come across a pack of wild dogs which had just killed an impala. The sun had still not risen so the light was low. With a pack of dogs we also needed depth of field so it was a challenging scene on which to work photographically. It is indescribably exciting to come across such a rare find in the bush. The Endangered Wildlife Trust estimates that between 3 000 and 5 000 individual wild dogs are left in Africa and these dogs are extinct in 23 African countries. Wild dogs are Africa’s most endangered mammal species. Wild dogs are members of the dog family. Some think Hyaena are a species of dog but hyaenas are not members of the dog or cat families but have their own family, Hyaenidae. Male and female wild dogs are similar sizes. The wild dog has romantically been called the painted wolf because of its blotchy white, black, ochre and tan colouring. Its blotching pattern is unique for every animal making identification easier than for carnivores such as lions. Wild dogs, like hyaenas, do not have retractable claws so cannot lock onto their prey with their claws and suffocate their prey like the big cats such as lions and leopards. They can only hang onto it with their mouths, so tend to attack on mass and start eating their prey when it is still alive. Wild dogs eat their prey very quickly to reduce the losses from lion, leopard and hyaenas. The pack usually makes excited chirping sounds around a kill but on this occasion they were noticeably quiet. This was probably because they knew there were lions and hyaenas in the area and it was still early so these predators were possibly still on the move. Wild dogs are cooperative hunters and feeders but there is an alpha pair which dominates the pack. Wild dogs are endurance hunters and are able as a pack to run down small prey ranging from baboons to impala and have been known to even take down adult wildebeest and zebras, though this is not common. The pack literally runs down its prey to exhaustion. While the rest of the pack is feeding there is always one member keeping guard so the pack is not surprised by a lion, leopard or hyaena. This alpha male had already eaten judging from the blood on his throat and front legs, and while on guard picked up the scent or sight of something which caught his interest. It turned out to be a hyaena. The hyaena came barreling into the kill scene to steal what was left of the impala carcass. The light was too low to get decent images of the intense scuffle which lasted a few seconds. The dogs tried vainly to nip the haunches of the hyaena but know only to well they do not want to get bitten by a hyaena. The hyaena prevailed and ran off with the remains of the carcass. The wild dogs did not pursue the hyaena as they has mostly finished the part of the carcass they could eat easily. The hyaena was last seen crossing the sand river bed with the remains, probably to go and quietly munch on the bones in a secluded spot. After the hyaena incident, the dogs relaxed on the sand bank and started to play among themselves. Wild dogs are highly social animals staying close together, playing often and will aggressively defend each other from external threats. After a brief play, the alpha male led the pack away from the kill scene probably because the noise and smell would eventually attract other unwelcome visitors. It was still early and the sun had not yet risen. The whole hunt scene lasted around 15 minutes. Wild dogs are nomadic but tend to remain in one area when the alpha female has pups. As you see with jackals, wild dogs seem to naturally run rather than walk. The alpha male led pack down onto the dry river bed and began moving downstream. The dogs were always vigilant. At this time of the day, sunrise, there are still nocturnal predators on the move. Given their size these dogs are no match one-on-one with lion, leopard or hyaenas. As the pack was wandering along the Mwagusi river bed, a troop of yellow baboons on the far bank further down river caught their interest. Out in the open sand bed they were easily spotted by the baboons which were foraging on the bank with the option of a quick get away to the trees nearby. It is not everyday you get to see a alpha male wild dog on a granite boulder in a sand river bed. It was not clear whether this pack was out hunting and whether there was a den with pups close by. Wild dogs are known to den for around three months a year while pups are being nurtured to the point when they can join the pack on a hunt. The alpha female gives birth to anything up to 16 pups at a time. The pack remained in the sand river bed for about 15 minutes before retracing their steps and heading up a gravel road and off in the bush not to be seen again on our trip. It is always special to see species which have become endangered.The International Union for Conservation of Nature’s (IUCN) Red List of Threatened Species has evolved to become the world’s most comprehensive information source on the global conservation status of animal, fungi and plant species. The African wild dogs is assessed to be endangered on the IUCN red list. 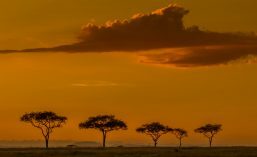 This entry was posted in Ruaha, Tanzania, Uncategorized. Bookmark the permalink. I love to see Wild Dogs – on the rare occasions that I have – and you have captured them beautifully both in word and with your magnificent photographs.